Chocolate Chip Toffee Fudge Cookie Bars with a graham cracker crust and a layer of toffee fudge! One decadent dessert recipe. Quite a name for a cookie bar. But I couldn’t leave any of it out! This recipe is inspired by one I found from pillsbury. I used my own chocolate chip cookie recipe for this treat. You start with a graham cracker crust. 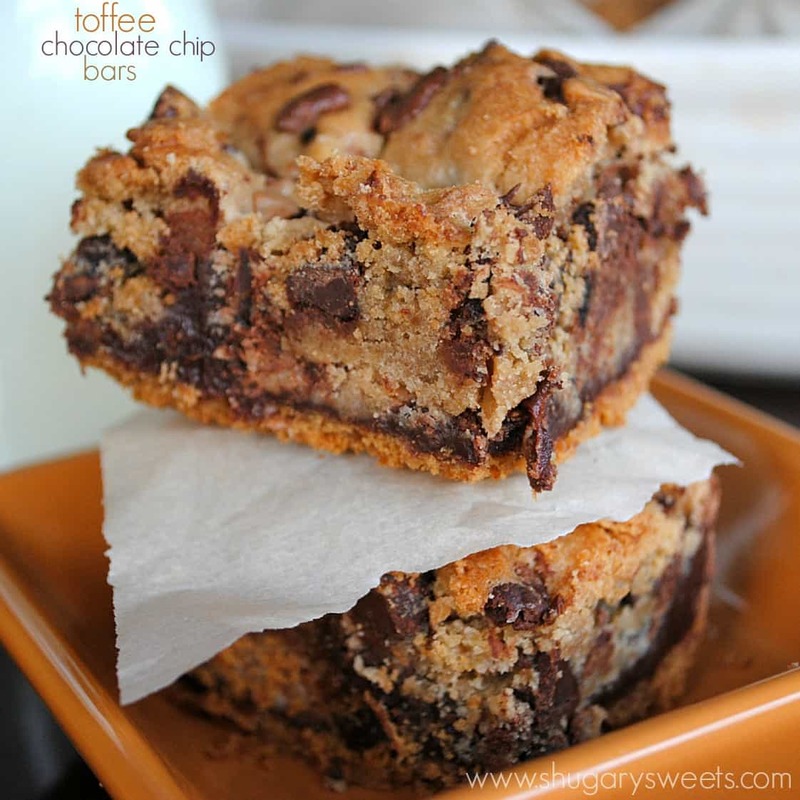 Follow it up with a layer of fudge and toffee chips. 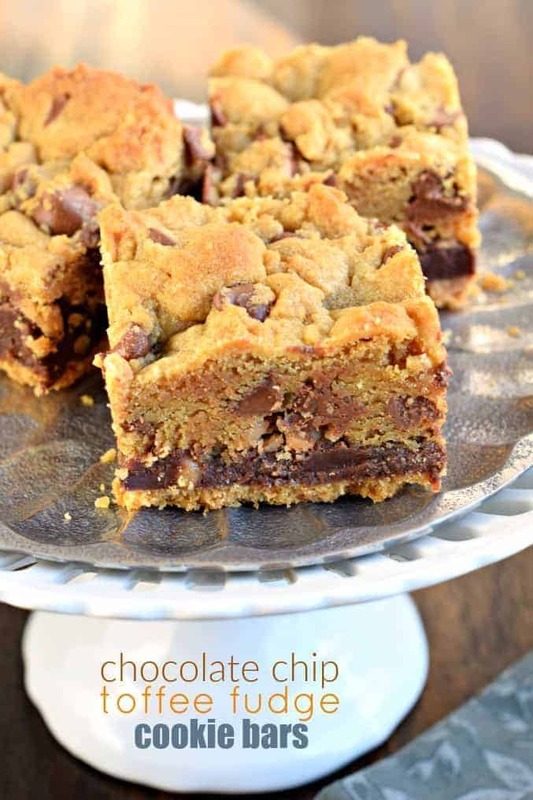 Top it with cookie dough and more toffee chips. Bake and enjoy! 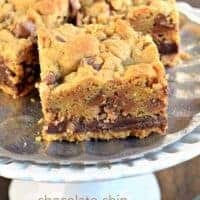 These cookie bars are rich and fudgy. Perfect with a glass of milk or dunked in coffee! Enjoy! In small bowl mix melted butter with graham cracker crumbs. Press firmly into bottom of a parchment paper lined 13×9 baking pan. In small saucepan, mix condensed milk with semi sweet morsels and butter. Heat over medium heat until smooth. Pour over crust. Sprinkle with 1/2 cup toffee bits. In large mixing bowl, beat Crisco with brown sugar, milk and vanilla until smooth. Beat in egg. Add flour, salt, baking soda and cinnamon. Fold in milk chocolate morsels. Spread over fudge layer. Sprinkle with remaining toffee bits. Bake in a 350 degree oven for about 30-35 minutes. Cookie dough may appear slightly under cooked. Allow to cool completely. Slice and enjoy! Sounds perfect to me…rich and fudgy…just the way I like my bars. I’ll be over for those and a cup of coffee, K? These sound SO good! I’m going to put this recipe in the “give it a try” file. Thanks so much! What a fabulous combination! These sound heavenly! They look so rich and fudgy!! That’s JUST The way (the only way) I like my cookies and baked goods! This has like, the best ingredients and that are all my favorite. I’m definitely bookmarking this and making it sometime! Oh goodness, these look fabulous! I’d love it if you shared them at a party I have going on at Project Queen!!! Always enjoy seeing your sweet delights. These pics are making me drool! They look so good! Oh my word is really all I can say, and maybe could you ship some out this way?? Those look terrific! My family would love them. I cannot wait to try this one out. 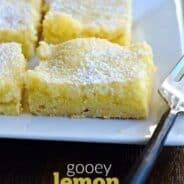 OH I think I just got a sugar high just reading this recipe! They look so delightfully sinful. Thanks for sharing. Amazing! Looks so good and it’s so bad! But I think we should be bad every once in a while! Yum! Oh, anything that involves heath toffee bits has my vote!!! I need about 4 of these stat, with a milk chaser! I don’t have butter flavor crisco…can I use butter? These look amazing! I have pinned and saved this to make soon! Love your blog and picts! Oh boy… these just made me realize how much I need some chocolate right now. Those look so yummy and by the way, your pictures are wonderful. OMG they look so good! 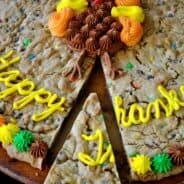 Will be baking this weekend! 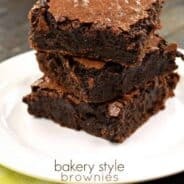 Could you let me know how I can print these recipes? These look amazing and I’m really excited to try them, but…I’m from the UK, what is crisco?? All my favorite flavors in one! 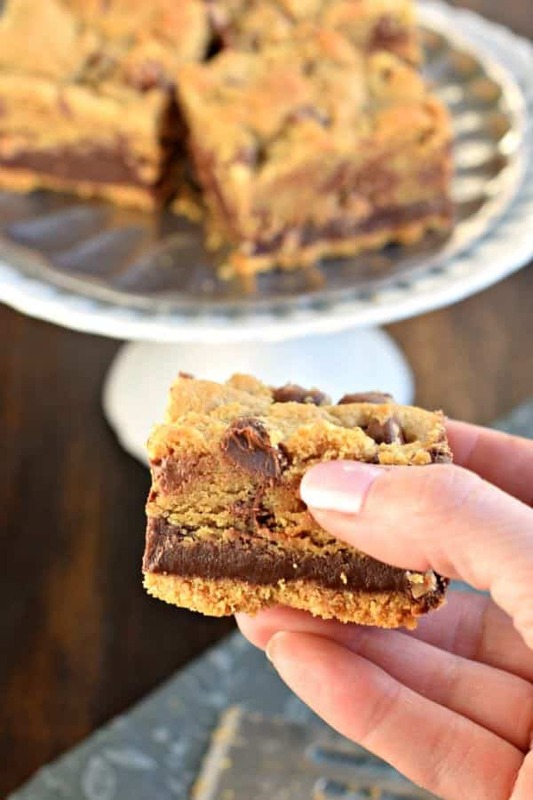 Chocolate and Toffee are a perfect combination and love the graham cracker in there too. Can’t wait to try these. and several other of your recipes!! One question-will you be buying me the new pants I will be needing:):)!!!! Good Day! I just would like to ask if I can substitute Butter-flavored Crisco with real butter? 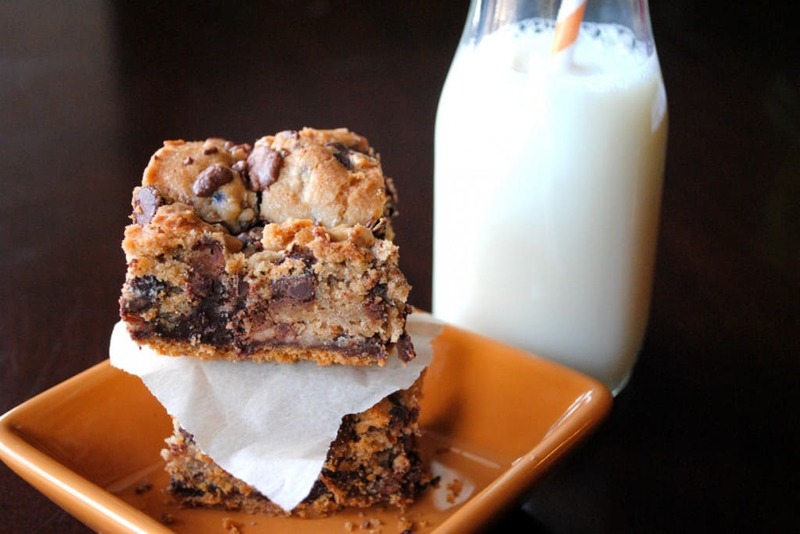 You can, but you will lose some of the texture in these cookie bars! Wow! That looks so delicious! I want one now! Can’t wait to try it! These are baking in my oven right now!! Aimee, is there another way to get a message to you? A regular email address or something. I had written a looonngg comment to you detailing an experience I had on your blog. Unfortunately, so some say, I am a detail person so I was giving you all of the annoying frustrations I repeatedly had trying to pin something(well, several something’s) from your site. In detail so that you would actually know what was happening. It has a lot to do with the varying loading times of your ads and arbitrarily being kidnapped from you site to be taken to the ad site, and the difficulties I encountered fighting, yes, fighting my way back multiple times. As I was proof reading it jumped me to an ad site and I lost it all. I think you should know the details as I might not be the only one this happens to. I was so frustrated trying to get the pins that I almost just gave up on the site vowing never to return. But the site is too good. Good recipes, good blog, good “rants” and “soap box statements” aka sensible personal opinion ionsgraciously (or not) shared (as the case may be). If you want to know the details please contact me. Oh I’m so glad to hear it!!! Thanks for letting me know 🙂 And following me for all these years!